Noah Hoffeld's "cello rock" is the new sound you never knew you needed. 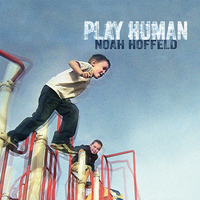 On his new LP, Noah Hoffeld brings the best of classical music and modern rock to bear to gorgeous effect. Hoffeld utilizes modern production flourishes to create a rich sonic soundscape to lose yourself in. Play Human is a masterfully executed work of art. Noah Hoffeld's passionate love songs and power ballads deliver his message that now is the best time for us to breathe and tune into who we are. Now in his debut album Play Human, he comes from the heart in eleven new songs that sing that message home. The soulful maturity of this rock record belies the fact that Hoffeld comes from a life in Classical Music. But playing Classical was never everything to Noah. 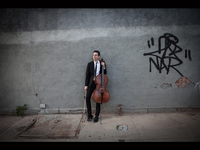 Before graduating from Juilliard, he began pushing the limits by improvising, bringing rock and pop to the cello, and asking questions that would push his career beyond the ordinary. Play Human follows on the heels of his single, 'One Family,' created for Martin Luther King Day 2015. The song was inspired by the intensity of current events and by what Noah calls "the ever-growing imperative of Dr. King's Dream." The vocal, set to piano and strings, rallies against abuses of power and backpedaling of the civil rights train. The self-produced song and music video were an internet success, shared by over 100 people in their first week on Facebook. 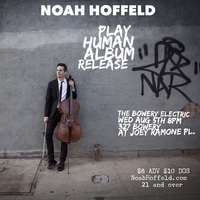 Noah's musical life is varied, alternating producing and touring his own music, playing featured cello for the likes of Renee Fleming, Philip Glass, Bebel Gilberto, and Brad Mehldau, recording cello solos for films like The Skeleton Twins (Kristin Wiig and Bill Hader), Experimenter (Peter Saarsgard), and for Showtime's Happyish and an upcoming HBO miniseries. And he's a composer himself, currently attached to two indie films in production. He enjoys arranging and producing other artists and his productions recently earned him a place on the endorsed artist roster of hallowed Moog synthesizers. In addition to rocking out on guitar and keys, Noah plays what he calls Cello-Rock. He sings while playing cello, creating pulsing, rhythmic patterns on the strings with the bow, and adds vocals to ambient layers of looped cello and drum programming. 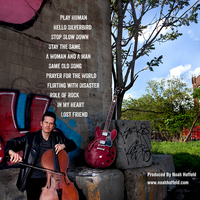 'Same Old Song' - the first single off Play Human- is a cello-based romp dedicated to the grooves he grew up on. Noah takes us back and lures us into our own musical memories with the infectious beat of this pop-rock tune. Growing up in a home that valued the arts turned Noah towards cello, piano and voice at a very early age. But it was his parents' eclectic listening habits that formed him. "Mom and Dad were both fanatical about art and classical music and they both worked in the arts, but they listened to all sorts of things. On any given day I was equally likely to soak in a Mozart Serenade as I was to be getting down to a new cut by Michael Jackson. I sang in the Metropolitan Opera Boys' Choir and went to pre-college at Juilliard on the weekends, but at night I was devouring records by Bowie, Lou Reed and the Beatles." All those influences find a home in Play Human. The debut LP, produced by Hoffeld and mixed by Mark Plati (Bowie, The Cure, Philip Glass) is the culmination of his musical searching and deeply held beliefs. 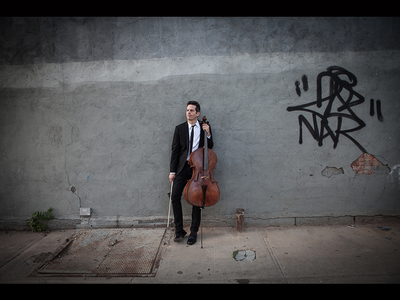 "I always wanted to share my view of things through the cello, purely through sound. But I came to a certain place where I realized using lyrics was going to be necessary. I had some very specific things I wanted to say. I couldn't stop playing for playing's sake but I needed to add another dimension to the picture." After graduating, he started to write songs. And spurred on by an intense need to communicate to a broader audience than just Classical fans, he taught himself to play guitar and bass, and to produce tracks to make those songs come alive. A longtime devotee of yoga and meditation, Noah believes in the power of reflection to create the change we're looking for in our lives, and he takes to heart Gandhi's 'Be the change that you wish to see in the World." The title song 'Play Human' incites us to take a bigger view of life, and to stand up for our brothers and sisters. The chorus shouts out, 'Why don't we all play human for a change? Loving each other shouldn't be out of range." And the thrashing 'Role of Rock' insists that saving the World is the purpose Rock was born for. Noah has been in a photo spread with supermodel Iman and taught cello to James Taylor. And he's a surfing novitiate at Brooklyn's Rockaway Beach. Noah recently released his single "Same Old Song", and already received high praises. Baeble Music says the debut song has an "irresistible 80's feel", and declares that "Noah Hoffeld's "cello rock" is the new sound you never knew you needed". Play Human will be available on iTunes, Amazon and streaming sites this August 5th.